this by placing Cerith Wyn Evans' TIXЭ, 1994, on the wall behind it. The gallerist invites us to imagine we've somehow gone through the looking glass, excluded for a moment from the world on the other side. So, a rather philosophical start to any visit here. Or maybe surreal too because the noble gases, one being neon, are surreal in their very nature because of their low reactivity (their outer shell of electrons is considered "full"). So some of the work shown here represents the use of unusual or new noble gas compounds (thus unusual or new colours), one example being Peter Saville's fluorescent rose (People Like Neon, 2012). There is a Damien Hirst work (a 7-syllable word with each of the letters rendered in a different colour) and a work by Brian Eno, Chord Tritone, 2017, composed of LEDs (light-emitting diodes) with Eno's specially composed music as an accompaniment. 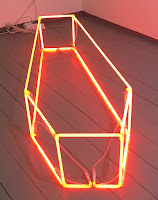 Since there is a limit to the number of neons you can show in any given space (otherwise they interfere with one another), the artists mentioned have all held back to give Peter Saville the lion's share of the space. 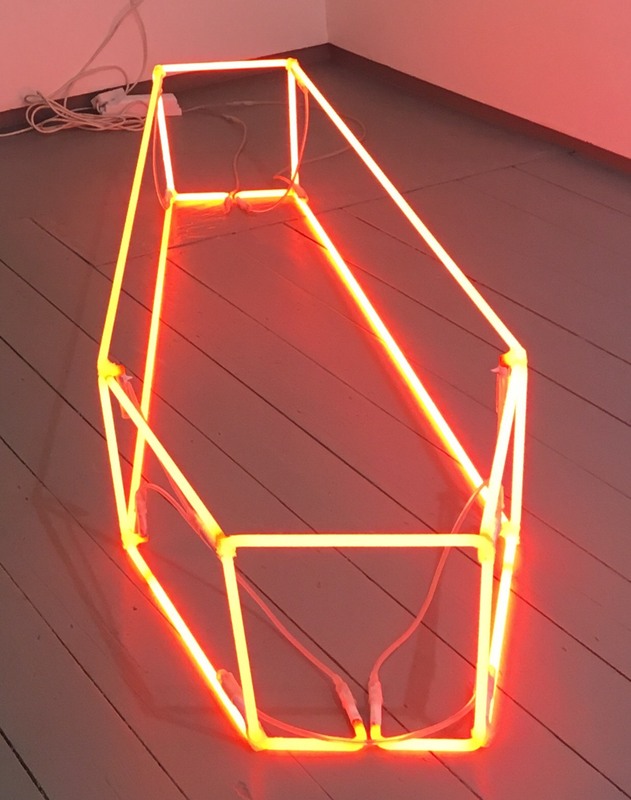 Saville has used his neon to encapsulate memories of his parents. He replicates the signature of each of them, 'Mum' and 'Dad' (Mum and Dad, 2018), in brightest white. It's a beautiful gesture. And neon techniques allow us to have our name in lights for around £100 (depending on length). if you would like to make a similar gesture, and are a collector, however new, Saville's studio will make you your own parental signatures (enquire at the gallery for prices). All the works, with the exception o Wyn Evans' are for sale; with price on application for the work by Sarah Lucas.